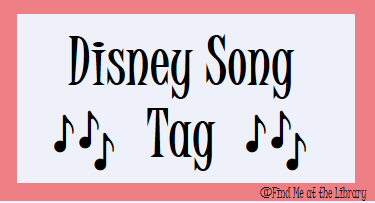 I decided it was time for me to create another tag! This one is inspired by some Disney songs that I enjoy, and I thought of some book questions that seemed to go along with the song. I haven’t seen this tag before, but I am sure someone has done this before! If you would like to participate in this tag, please feel free to do so, just please post a link to Find Me at the Library on that post. Alright, let’s get started! 1. A Whole New World- What is your favorite newest fantasy series? Well, I’m not too far into it right now, but I’m reading The Darkest Minds and it seems pretty good so far. I’m not sure how ‘much fantasy is in it, but from where I am now it seems to be heading down that road. 2. Part of You World- What book world would you like to live in? 3. Let it Go- What book/series do you wish everyone would stop talking about? For a while, I was always hearing things about the Hush Hush books. I never read them and I refuse to read them, just because I can’t imagine them being good. These people who never read decide to read that series in particular, and while I’m glad they are reading, couldn’t they pick a better one? 4. When You Wish Upon a Star- What book or series do you wish you could have more of? I feel like a good answer would be Harry Potter for this because no one gets tired of it, but I can’t use it for all my answers. I suppose the next one would have to be Percy Jackson and his adventures, because there are tons of greek myths that Rick Riordan could work with. 5. Supercalifragilisticexpialidocious- What is the longest book you have read? I have to clock in Harry Potter and the Order of the Phoenix for this one, which if I am remembering right, has around 894 pages. 6. Hakuna Matata- What book could you read over and over without a care in the world? Divergent, because I have reread that book more times than any other book. It always starts out with me just going through my favorite parts, and then I just end up rereading it. 7. A Spoonful of Sugar- What couple has the sweetest relationship? Of course, I have to go with John Green’s Hazel and Gus. They meet and everything in their lives are better. Gus is the sweetest guy ever, and even spends his wish on something he wants to do with Hazel. Even though they don’t have the longest relationship, their little infinity is truly the greatest. 9. Zero to Hero- What character wasn’t expected to be a hero? NEVILLE LONGBOTTOM. Poor Neville, no one ever believed in him. Then he came out against Voldemort and ended up killing a horcrux, showing how awesome he truly was. 10. You’ll Be in My Heart- What Character death made you cry the most? Probably Augustus Waters because if someone didn’t cry at that, they have no heart. A close second would have to be Tris, because I just really wasn’t expecting that to happen at all. If you decide to do this tag, please leave you post below so I can see them! Also, if you are someone who enjoys doings tags like these, comment below so I can start tagging you and putting your link on here, that way you know a new tag is up. I hope you have fun if you decide to do it. I’ll also be doing this tag in the next few days (hopefully). I’ll be sure to put a link in for your blog. And, for future reference, I would totally be up for doing different tags, if you would want to tag me! I just saw this on Stephanie’s Book Reviews and it looks like a fun tag! Thanks! Disney movies and books are pretty much the ebst things in the world. If you do it, please link it up to me, because I would love to see your answers! And I would love to do these tags, so in future you can tag me if you want to! I recently did my first ever tag, and I love them.. So would u pleeease tag me in future? And I’ll be doing this one soon- its awesome!! I will put you on the list! I agree, tags are fun! I will have a springtime one up very soon. Saw this tag on another blog and thought it looked like fun. Thanks for creating it. Thanks for doing it! I’ll go check it out! Pingback: | 100 Followers and 100 Posts!